Truffles are so good but they’re a pain to make. 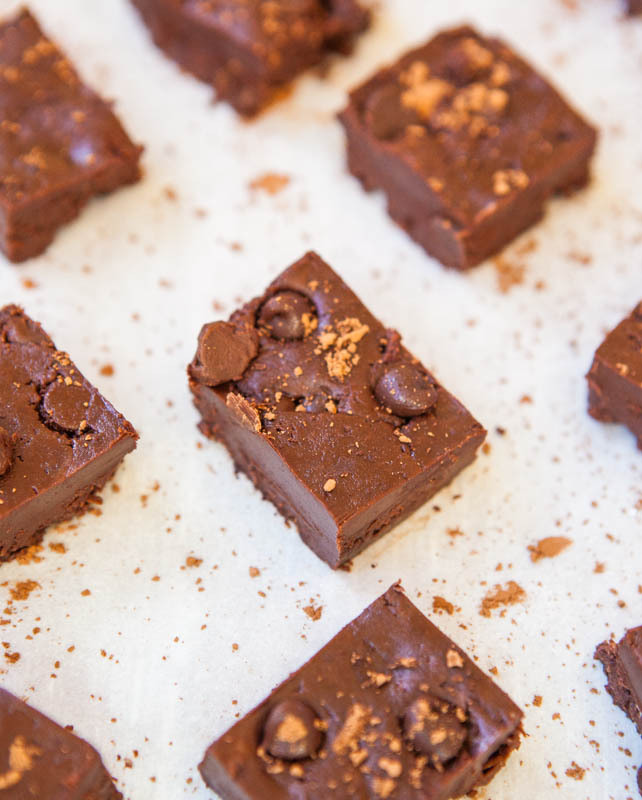 These sliceable bites provide the richness of a fudgy brownie crossed with the decadence of a truffle, minus any tedious rolling or dipping. I didn’t know what to make with the remaining Nutella after the Nutella Cinnamon Rolls but I started thinking truffles. And promptly talked myself out of that idea. I just don’t have the patience to melt chocolate with heavy cream, wait for it chill for a few hours, only to have to roll out dozens of little balls, which each require being dipped in melted chocolate or dredged through cocoa powder. No thanks. I am the queen of bars and desserts-in-a-pan and decided to incorporate my fondness for Nutella Brownies with no-bake truffles that are pressed into a pan and sliced rather than rolled. Such a time-saver. The batter comes together in one bowl in five minutes and they can easily be kept vegan and gluten-free. 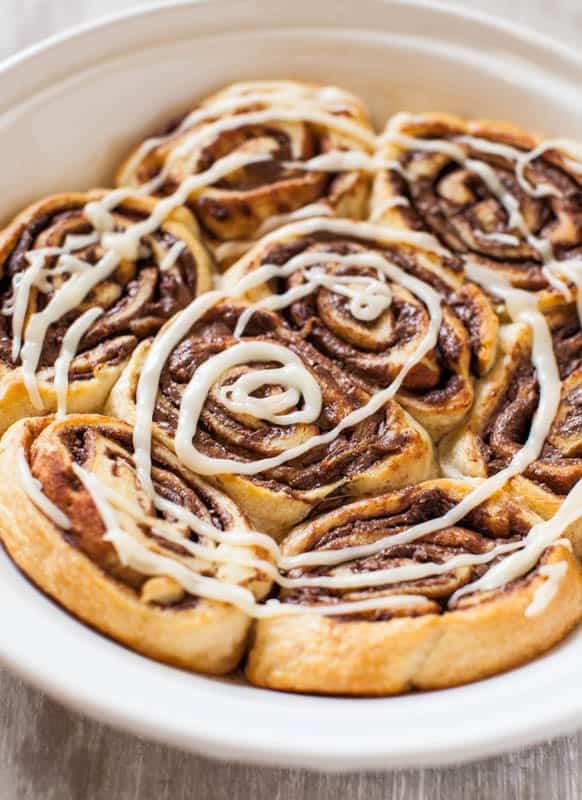 To make the bites, combine Nutella, softened butter, confectioners’ sugar, cocoa powder, one-quarter cup flour, and stir until combined. Those ingredients are the fundamentals in chocolate slice-and-bake-style shortbread cookies, but my theory is why bother baking cookies if I can have something that tastes like a cross between chocolate-cookie cookie dough, a fudgy brownie, and a truffle. I’m sure you understand. The dough is thick, dense, and will seem quite wet. Add additional flour, one tablespoon at a time and only as necessary, in order to take it from wet and sloppy to smooth and malleable. One or two tablespoons can make the difference from gloppy to crumbly. When judging dough consistency, ask yourself, could I pack this into a pan and slice it into bite-sized pieces that will hold their shape? Depending on your answer, play with the flour ratio in small amount. If you happen to over-do it, adding a touch more Nutella will re-moisten it. I used one quarter cup plus two tablespoons of flour. 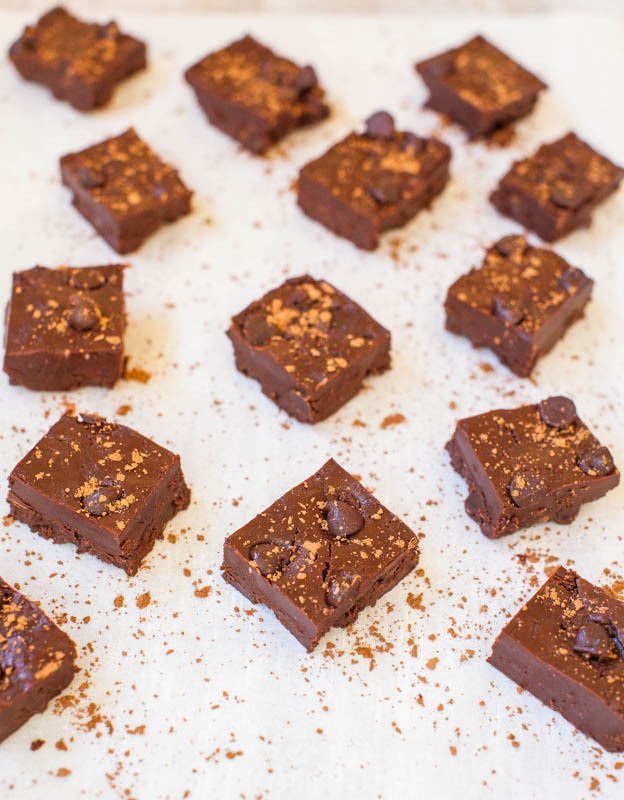 Fold in the chocolate chips and transfer mixture to a foil-lined and sprayed 8-inch square pan. If you have a 6-inch square pan, it’s ideal and use it, but most people don’t. Therefore, it’s important to note that the mixture should cover only two-thirds of the base of the pan, leaving approximately a two-inch bare margin. 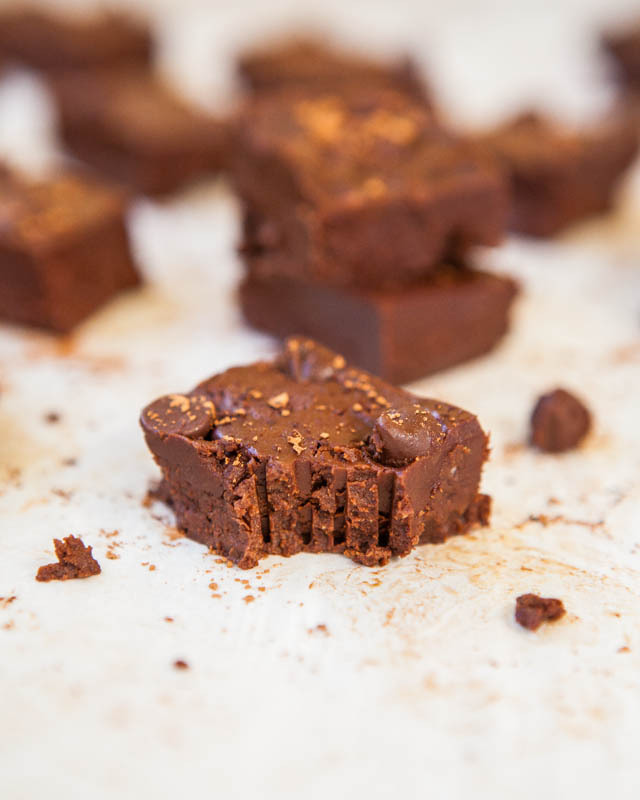 Don’t spread it over the entire surface because the truffles will be thin and flat. I want something that I can really sink my teeth into and prefer thicker bites, which is why using only a portion of the pan is advantageous. Allow the mixture to set up in the refrigerator for at least two hours before slicing and serving. The bites are rich, as anything would be made with Nutella, butter, sugar, and two forms of chocolate is, so I slice them on the smaller side. These are truffles after all, a rare treat in which I’ll concede bigger isn’t better. The dark nuggets will keep for many weeks in the refrigerator or freezer. I store them in the freezer here in Aruba and they never freeze solid, thanks to the butterfat and Nutella. I recommend storing them in either the refrigerator or freezer not only because there’s butter in them, but because dark, rich, and fudgy desserts taste better and more decadent when served chilled. Remarkably, they stayed quite firm even in my 88F degree hot and humid Caribbean kitchen, a welcome change from most other chocolate treats that tend to melt in minutes. In more normal climates, you could likely keep them sitting out for many hours before they’d soften much. 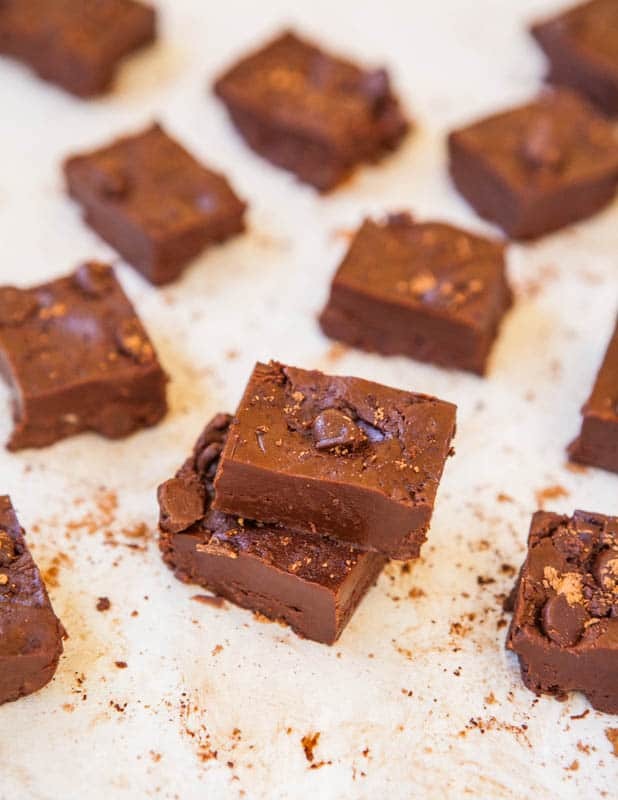 Although they’re sweet, they’re not overly sweet treat like traditional fudge tends to be. There’s just one-half cup confectioners’ sugar added to the entire batch, and it’s done for both bulking the batter, drying it out, and offsetting the bitterness of unsweetened cocoa powder. What the bites lack in sugary status, they make up for in richness and creaminess thanks to both the butter and Nutella, which also adds a hint of hazelnut flavor. They’re dense, very chocolaty and fudgy, which is how I like my brownies. 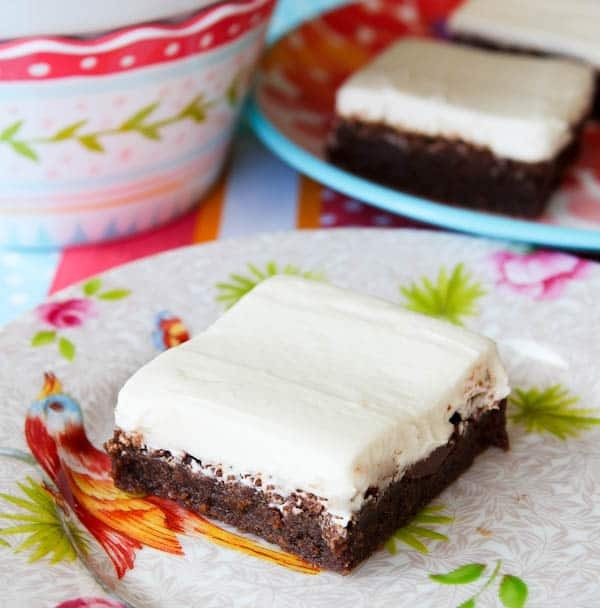 They’re much more fudgy like brownies than like actual fudge, which tends to be far too grainy and sweet for my liking. The chocolate chips in every bite boost the chocolate intensity and add welcome texture. 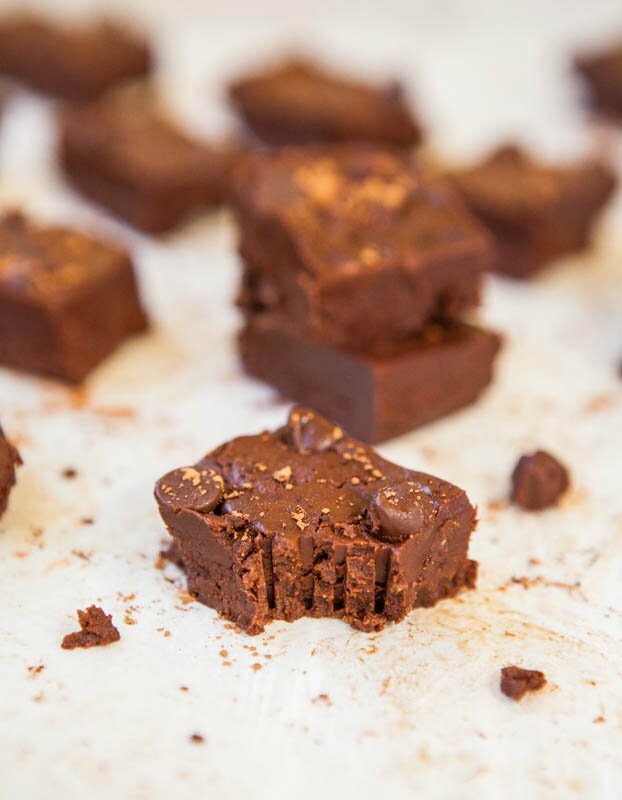 Part no-bake fudgy Nutella brownie, part rich chocolate-cookie cookie dough, and part decadent truffle. It’s dangerous that they’re a five minute project. Line an 8-by-8-inch pan with aluminum foil, spray with cooking spray; set aside. In a medium-sized mixing bowl, combine Nutella, butter, sugar, ⅓ cup cocoa powder and stir until a thick paste is formed. Add ¼ cup flour slowly, stirring until the dough firms up and combines. Dough should be sticky enough to hold together - imagine it being pressed into the pan and you'll need to slice it - so not wet and sloppy, nor dry and crumbly. 1 to 2 tablespoons flour can make the difference between a workable dough and not. Add flour only until dough combines and if you overdo it and dough becomes too dry, add a touch more Nutella to re-moisten it. I used ¼ cup plus 2 tablespoons flour. Add chocolate chips and fold to incorporate. It will be a bit challenging to fold them in because dough is thick and dense, but keep stirring until incorporated. 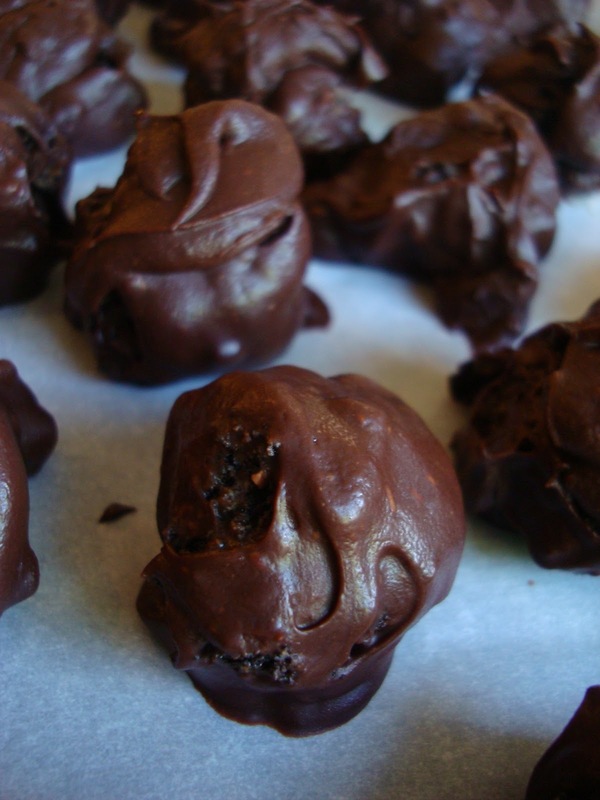 Do you like truffles or make them? Or make anything with Nutella? Tell me about your favorite recipes. Merry Christmas!!!! and thank you so much for making these into bars… I don’t have the patience either…but I do love eating truffles other people make!!! And next time you have a little Nutella to spare, these are so easy to make! 1. You’re wasting my Nutella! 2. This is not as good as pure Nutella. Nothing is good as pure Nutella. 3. You don’t need to try to make me Nutella sweets. I’m fine with on a spoon, thank you. But I’m going to make these at some point anyway! :D I just won’t tell him what’s in it. yummm these look sooos good ! anything with nutella added is a plus in my book! Oh my – it would be too dangerous to have around the house! I’d eat this nonstop! 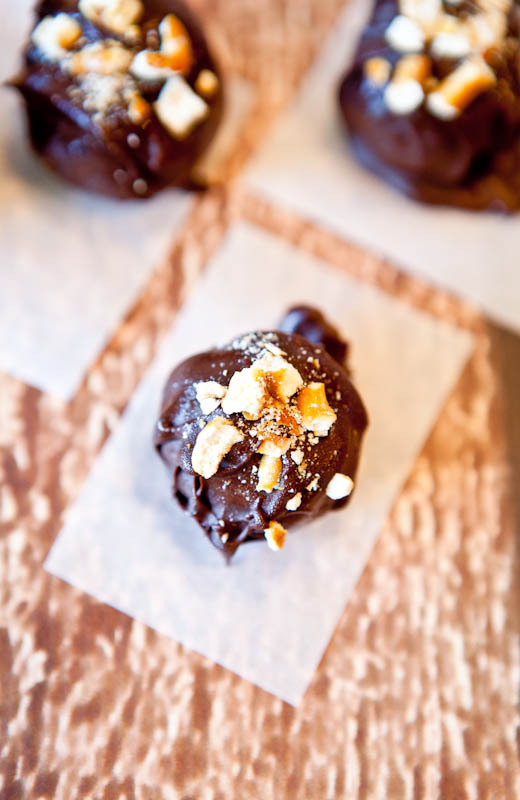 These are my kind of bite-sized truffle–I’ll be in the running for holiday dessert extraordinaire at this year’s family dinner for sure if I make this. And if that happens, thanks a bundle for sharing, Averie! 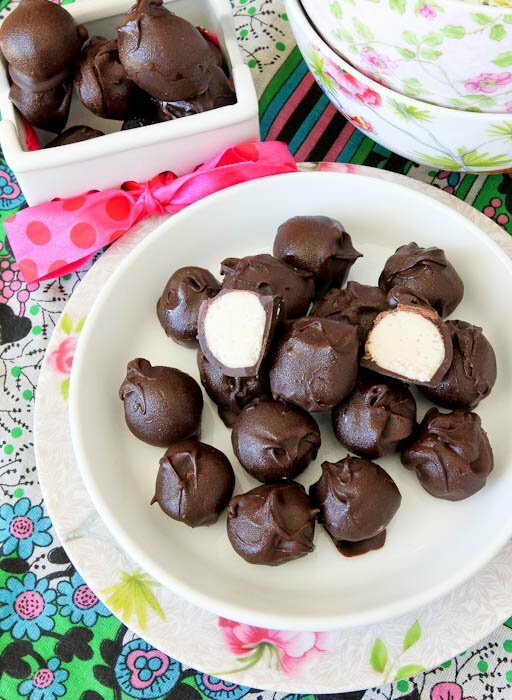 These sound SO much better than fudge! You are such a smarty! Yum yum yummmmm! I just tried these. I bought a sample pack of Justin’s choc hazelnut butter at our local natural grocery, halved the recipe and was in heaven at first bite! They are delicious and satisfy my love for fudge and truffles!! How do you think it would work if I tried subbing coconut oil for the vegan butter? I would be a bit hesitant because coconut oil melts at warmer room temps which could cause these to become very melty or prone to it – if you knew 100% they were going to be stored in the freezer or fridge, then fine; but not to sit out for any length of time as they could become quite soft in a way that’s even softer than butter/vegan butter would make them. Then again, it may be fine! Started making these and realised halfway in that I was out of both chocolate chips and cocoa powder. I just carried on anyway and they were still very good and everybody loved them. They disappeared FAST. Great way to use up a jar of Nutella and share it out to prevent yourself from eating the whole addictive thing gradually by the spoonful. Glad they were a hit with everyone & disappeared fast, too! Do you think people would judge me if I ate a whole batch of these?! You’re a genius!! 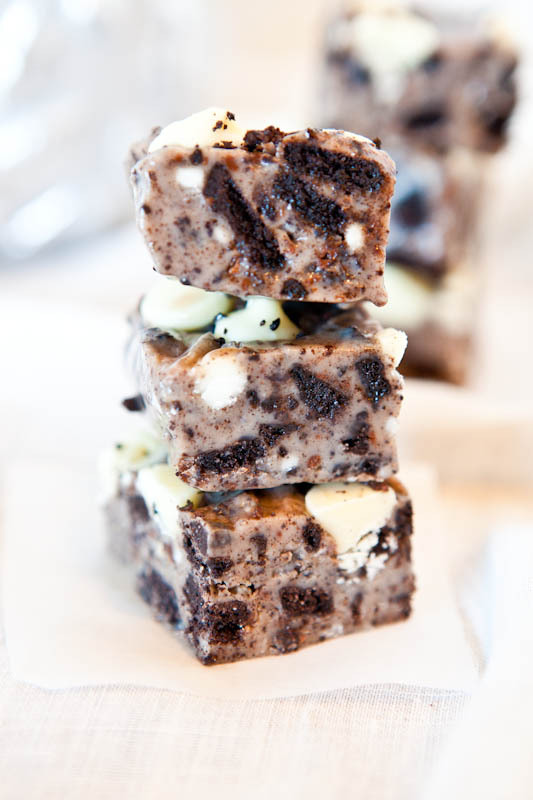 I am definitely making this tomorrow to satisfy my choc cravings! :) Do you think I can sub Nutella with good quality chocolate? 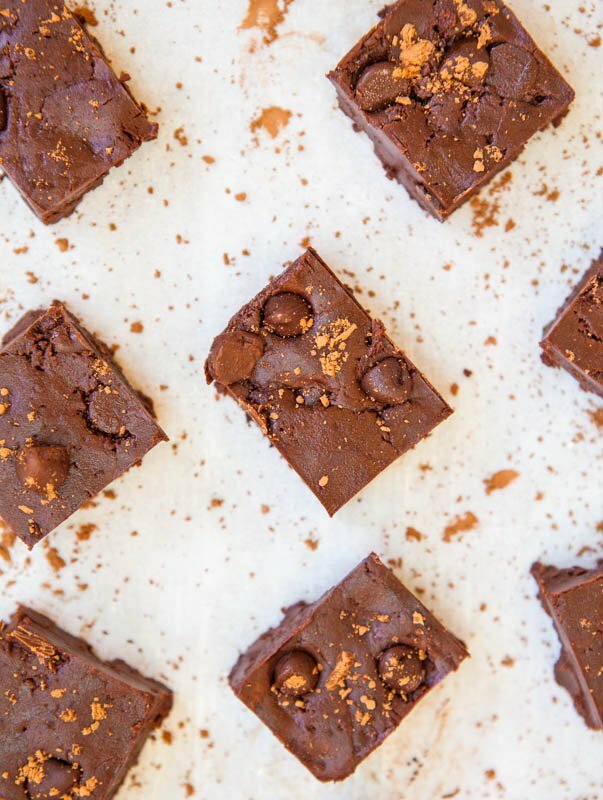 In this recipe, Nutella is the star of the show and is going to give the recipe the truffle-fudgy brownie consistency that you’re probably not going to be able to achieve in any other way. If you do try it another way, please LMK how it goes! These sound fantabulous! What are the measurements for the ingredients? Read all the way through the post, they’re there. Do you think these will melt if I bring them to school? If not, I may have to use an ice bag or something like that. Also thanks for all the no-bake dessert recipes! You’re awesome :) and I had to find something gluten-free for my teacher as well so this works wonderfully! It depends how warm your climate is, and if you think an icepack may help, use one. They won’t likely melt, but could get a little soft depending on how warm it is where you are. How nice of you to bake for your teacher! Hi, recently I found your website when searching for Nutella recipes and it is so awesome. I have a question, is it ok to eat flour raw without cooking it? 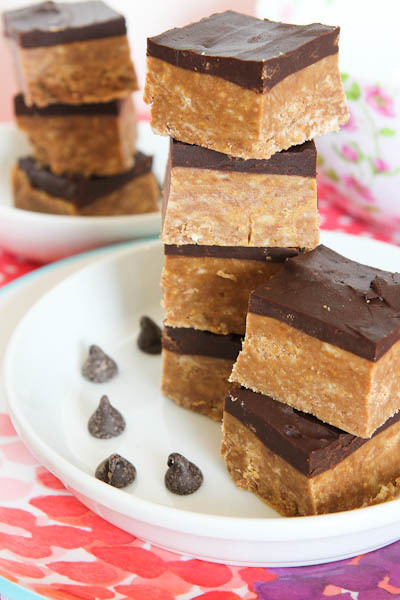 as this is a no bake recipe. Thank you. I wrote this post 5 years ago and in that time, there have been sources that say it is unsafe; as well as sources who say it is safe. For me, it’s totally fine. But to each their own.